''View of the Port of Livorno'' (1601-1604), a table top by Cristofano Gaffuri from a design by Jacopo Ligozzi. It was used by the ancient Egyptians and Babylonians for jewelry and amulets, and its reputed magic aura as a defense against the evil eye goes back thousands of years. Its diffusion in Europe began during the Crusades, but its rarity and cost meant that it could be afforded for the creation of art works only by the richest of patrons. Prominent among these were the Medici who, during the 16th century, built up a unique collection of objects — from bowls, goblets and jugs to inlaid pictures and furniture — made from and adorned with this precious stone. The collection now forms the centerpiece of an absorbing and sometimes dazzling exhibition, "Lapis Lazuli: The Magic of Blue," that stretches from the third millennium B.C., in the form of a royal seal from Mesopotamia, through the Middle Ages, the Renaissance and Baroque periods to the search for synthetic blues in the 19th century and the revived use of genuine lapis lazuli by jewelers in the 20th and 21st centuries. The show was curated by Maria Sframeli, Valentina Conticelli, Riccardo Gennaioli and Gian Carlo Parodi, and continues until Oct. 11. The first section of the show, "From Nature to Artifice," opens with raw samples of rock, illustrating the wide variety of patterns and colors it manifests. There follow nearly 20 examples of lapis jewels, amulets and statuettes from ancient Mesopotamia and Egypt, all of them small in size and reflecting the extremely limited availability of larger pieces of rock at that time. Ground lapis lazuli was increasingly used by painters during the 13th and 14th centuries to make ultramarine and Cennino Cennini gives instructions on how to prepare this pigment in his "Book of Arts." But it was not until the second half of the 16th century that large objects carved from lapis began to appear in Italy. The first center of production was Milan where the Miseroni brothers, Gasparo and Girolamo, became famous for their mastery of working this challenging material. Half a dozen of the pieces acquired by Grand Duke Cosimo I Medici are on show here, including the "Cup in the Form of a Shell" referred to in a letter of 1563. Cosimo's successor, Francesco I, brought craftsmen from Milan to carve lapis in Florence in the early 1570s. Francesco expanded the Medici workshop for the production of these objects, which continued under his brother Ferdinand, who succeeded him in 1587. There is a stunning array here of these ornamental pieces, exquisitely carved and substantial in size. In 1588 Ferdinand reorganized the Medici workshops and enlarged the scope of their productions. He had spent many years in Rome, where he developed a taste for intricate inlaid table tops. 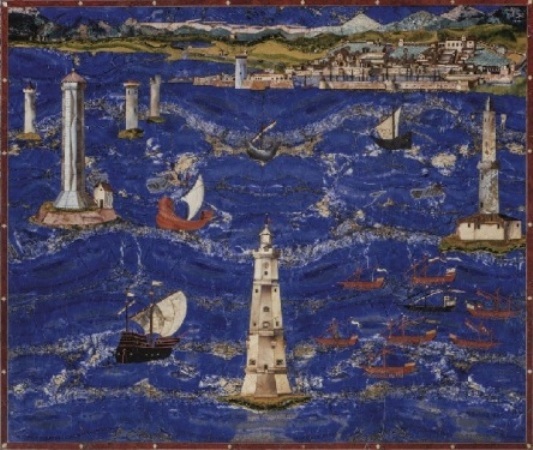 He now employed the skills of his designers and craftsmen to create some extraordinary landscape table tops, which fully exploited the natural patterns of lapis to represent foam-flecked seas and skies with billowing clouds, such as the "View of the Port of Livorno" and "Tuscan Landscape," both on show here. Also on display in this section, entitled "Mosaics in Hard Stones and Painted Stones," are a series of painted scenes on lapis panels, a form that became increasingly fashionable during the first half of the 17th century. The color blue was little used in the classical Roman world, perhaps because the hue was identified with the attire and body painting of barbarian races. Possibly because the color was devoid of pagan religious associations, the depiction of the Virgin Mary in blue became popular from the 12th century. Ultramarine, made from lapis, was ideal for this purpose on account of its exceptional color stability (the alternatives, such as azurite pigments, tended to turn green or black over time). The durability of lapis paints is illustrated in the final section of the exhibition, "From Ultramarine to Klein Blue," by 15th-century illuminated manuscripts, paintings on panel by Lorenzo Monaco and Fra Angelico, a detached fresco by Melozzo da Forlì and a 17th-century canvas by Sassoferrato. The price of good quality lapis lazuli was remarkably stable for hundreds of years, an ounce of lapis typically costing around the equivalent of an ounce of gold. Thus, even when new sources of the stone were found, in Siberia and Chile, for example, the purest product remained extremely costly. Prizes were offered in the early 19th century for the discovery of a cheaper, synthetic substitute. This was achieved, although the color was not as deep a blue, by the French chemist Jean-Baptist Guimet in the mid 1820s. Ingres used it in 1827 for his "Apotheosis of Homer" (now in the Louvre), declaring himself very satisfied with the result. During the 1950s, the French artist Yves Klein tried and failed to concoct a blue as intense as that used by Giotto. He turned to édouard Adam, a dealer in paints and an amateur chemist, who produced a successful formula. The composition of this was officially registered with the "Institut national de la propriété industrielle" in 1960 as "IKB" (International Klein Blue) without, however, any mention of édouard Adam's name. The color, used in numerous subsequent Klein works, is represented here by a version of his "Victory of Samothrace." But artists have continued to return to the original, inimitable stone. Notable among these are the jewelers of the Padua Gold School. Of the inventive examples on show here, the most striking is a beautiful brooch of 2009, by Annamaria Zanella, in the symbolic form of a folded piece of ultramarine drapery. Inspired by Antonello da Messina's "Annunciata" painting of the Virgin in Munich, it is enameled with lapis lazuli powder, prepared with the aid of Cennino Cennini's and other Renaissance manuals. Lapis Lazuli. The Magic of Blue. Palazzo Pitti, Florence. Through Oct. 11.